The Project – SmallChange4BigChange was established in 2012 in the small rural town of Santa Caterina de Baranhona, located on the outskirts of Antigua to improve health and education in the community. Currently 35-40% of people in Santa Catarina suffer from chronic malnutrition – this occurs when children don’t get the nourishment they need from the time of conception until the age of two (the 1000 day window) and it will affect them forever. As children, they struggle through school and as adults, they have difficulty understanding new concepts or ideas. SC4BC aims to change things ‘poco a poco’ – slowly but surely – and has implemented a wide range of programmes including installation of ecological stoves, tilapia ponds, community gardens, cookery lessons and aims to improve education through school supplies, English classes and a reading room as well as a safe place for children to spend their afternoons with books, puzzles and activities. Our support – The LATA Foundation has worked on a number of projects with SmallChange4BigChange since 2016 and have been impressed by the dedication and passion that Lisa and her team invest in the community. We initially helped fund the construction of Tilapia ponds for 10 families as well as chicken rearing classes and a gardening club for pre-schoolers. 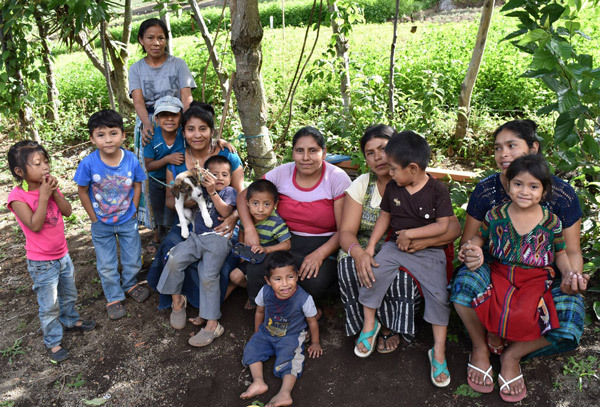 In 2017 SmallChange4BigChange collaborated with the Guatemalan government to run a Mother & Baby Nutrition course to address basic health issues and promote active, healthy habits from infancy to adulthood and the LATA Foundation funded this pilot project. The response was overwhelming but due to a lack of space numbers had to be capped at 20, with 15 women finishing the course. SC4BC has now built a bigger multi-use space that can accommodate up to 40-50 participants in 2018. The LATA Foundation is delighted to continue funding the Mother & Baby programme as well as a complimentary Healthy Home programme which teaches the community to cook using economical, local and healthy ingredients.